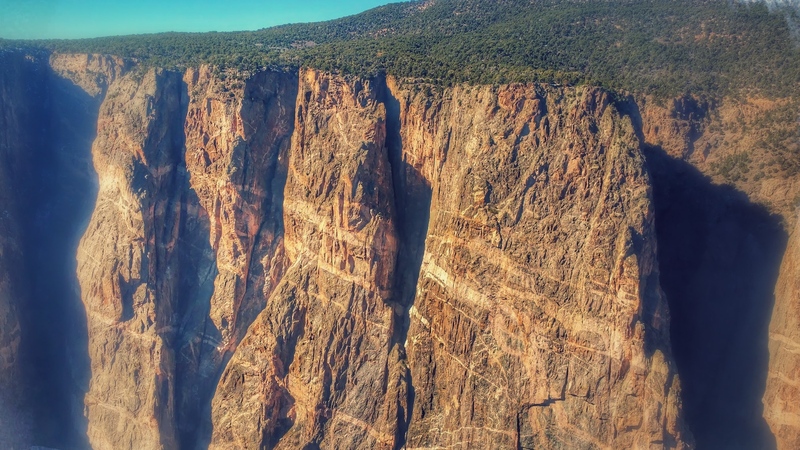 Of the 59 national parks in the U.S., most are unheard of/unknown, and that is definitely the case for the Black Canyon of the Gunnison National Park. Maybe because it’s such a small park. Maybe because it is simply overshadowed by Colorado’s other popular national parks such as Rocky Mountain or Mesa Verde. But despite its unpopularity, gazing down (and hiking down!) 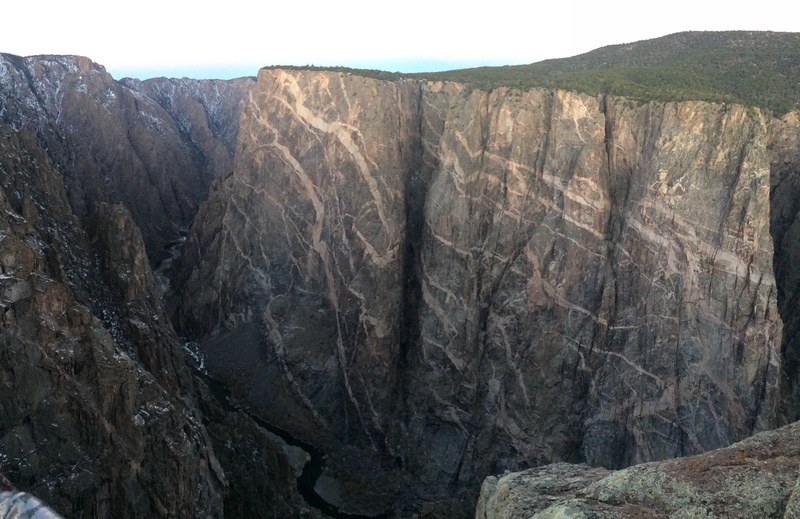 into the canyon is spectacular, especially gazing at the famed Painted Wall at sunrise, Colorado’s highest cliff at 2,250 ft. tall. 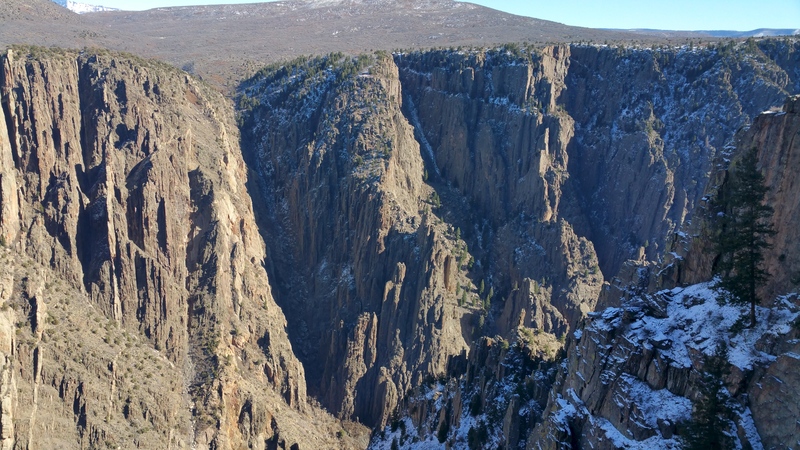 There is a reason why it is called the Black Canyon. With its steep drop offs and incredibly narrow walls, it is said that certain areas of the inner canyon only see about 33 minutes of sunlight per day. In constant shadow, the walls appear to be a perpetual, menacing black. Due to the off-season, there were no entrance or camping fees in the park. 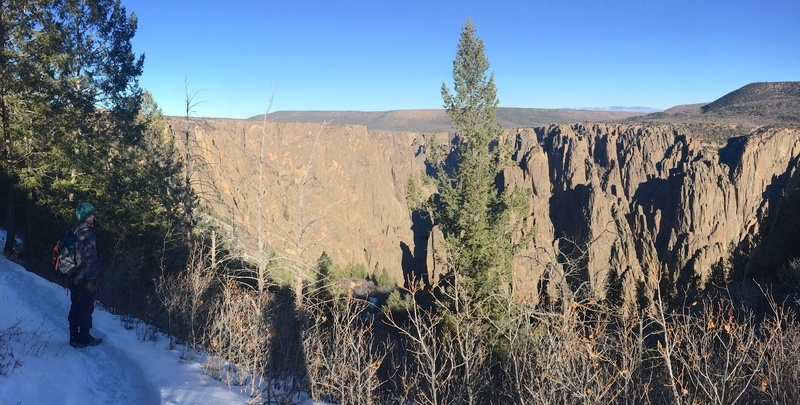 However we chose to stay on BLM land in the adorable, friendly town of Montrose, the nearest town to Black Canyon of the Gunnison. The Montrose Fairgrounds provided a free RV dump, and a nearby truck stop also had free potable water–we were pretty much set in Montrose with the free campsite, free water, and free dump! 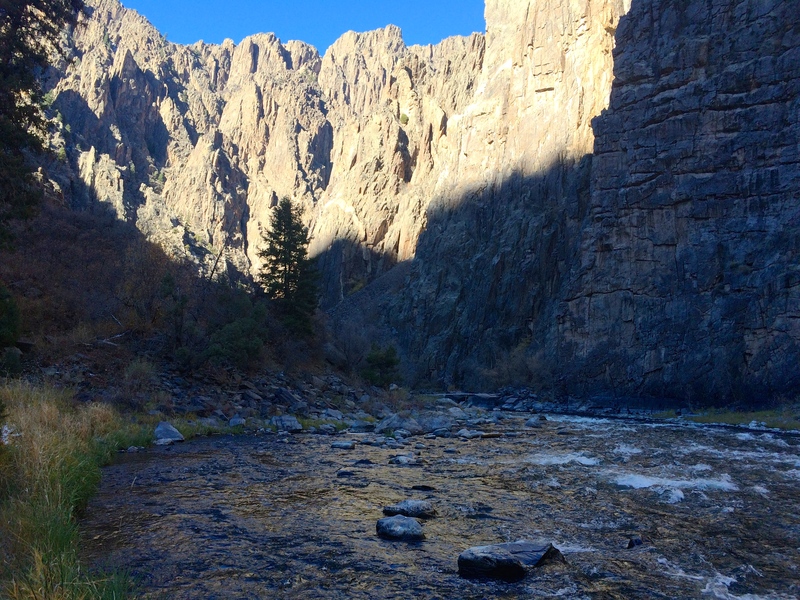 We arrived at the visitor center exactly when they opened at 8:30am with the sole purpose of getting wilderness permits (which were free) to hike down the canyon to the river. Having done all my research prior to coming to the park, I knew exactly what I was getting myself into. 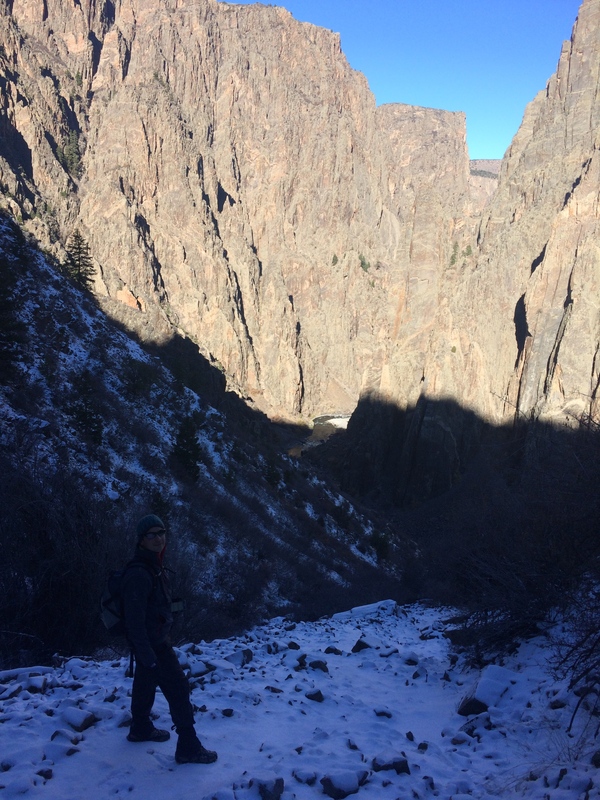 Of the several trails down into the canyon, the 1-mile Gunnison Route was the easiest way down. One mile? Psh. Sounds easy, right? Tack on 1,800 ft. of elevation gain, an 80-foot chain on a steep section of the trail, loose rocks and scree, and you’ve got yourself quite the climb. And because it was November and a storm just passed, add some snow and ice too. I read that park rangers enjoyed giving hikers a hard time to prep them for this suffer-trail, and no doubt, the conversation we shared with the ranger was amusing. Then I told the park ranger how I really had to push Chris to come with me on this hike. I didn’t want to go alone. All hikers are supposed to check in with the park rangers at the visitor center upon returning from the hike. If hikers don’t check in, the park rangers would have to assume help is needed and they’d send someone down to help. “Don’t be like the Texans. They always get stuck down there and need help,” were his last words. We still don’t know if he was joking or not. And off we went. The Gunnison Route started from the visitor center. Easy enough. But first, we gazed down into the canyon from the overlook to prepare ourselves for what we signed up for. 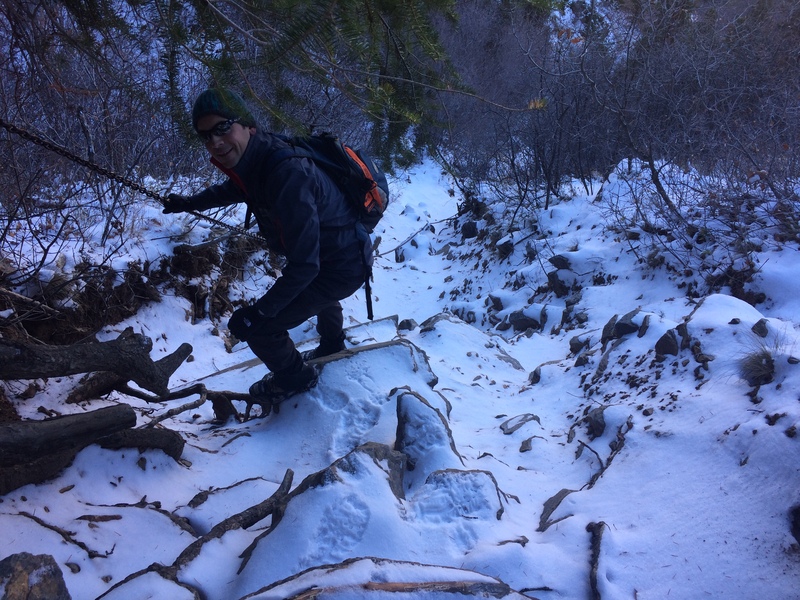 When the trail actually began its steep descent into the canyon, we put on crampons. I will say that the crampons were useful for descending, but I didn’t need them for ascending. The chain, THE CHAIN! The top of the chain was located about 1/3 of the way down. I found the chain more helpful going up than down. It was also frozen and sticky with dry snow; clinging onto the chain numbed the crap out of my hands. Down, down, down. Down into the canyon we went. Loose rocks with snow. Scrambling was fun. And finally, the canyon bottom! It took us about 1 hour and 10 minutes from rim to river. The powerful, gushing river produced some rapids, and the morning sunshine spilled brightness all over the opposite canyon walls–it was too surreal. Had it not been so damn cold the bottom of the canyon would have been the perfect backcountry campsite. We didn’t stay too long at the bottom–we were too cold! 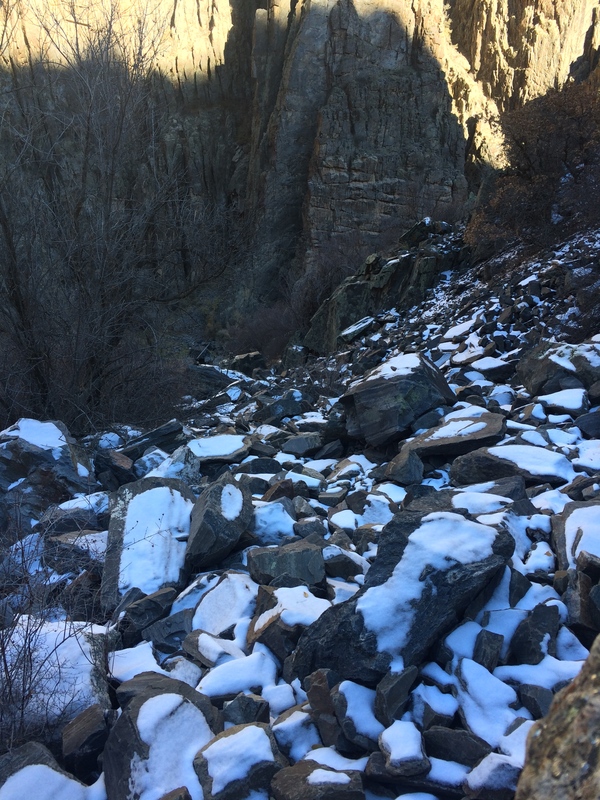 The 1,800 ft. climb wasn’t as awful as I anticipated, but I still lost my breath scrambling over rocks and using tree roots to pull myself up over steep ledges. Although the fresh snow made it slippery going down, we appreciated the snow going up. Snow tracks prevented us from getting lost, a common problem for hikers going back up on a steep trail without cairns or signage. Our ascent took us an hour and a half, for a total roundtrip time of 2 hours and 40 minutes. After checking back in with the park ranger (and exchanging a few more sarcastic lines) we drove along the 7-mile South Rim Road, occasionally stopping at a couple overlooks. With the afternoon sun overhead, the canyon walls were filled with dark shadows which prevented me from seeing Painted Wall at its finest. Determined for a better photo, I got up at 5:40am the next morning to drive into the park from Montrose. I got exactly the experience and photo I was hoping for. Over billions of years, layers of rock formed the canyons we see today, and it is especially evident on this wall. No photo can justify its scale. The streaks of color on this wall are gigantic in real life, but from afar it looks like a wall with paint splatters, hence its name. I’ve never seen any other canyon like it. It’s not the Grand Canyon or Canyonlands, but it’s still a dramatic, beautiful canyon. 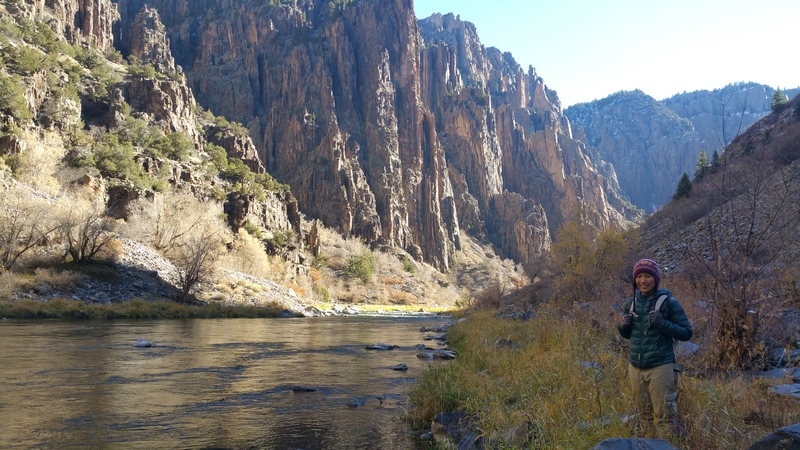 With wonders like Painted Wall, epic hikes down to the river, and peaceful solidarity due to infrequent visitors, the Black Canyon of the Gunnison will surely take anyone’s breath away. Literally. This entry was posted in Colorado and tagged gunnison route, painted wall. Bookmark the permalink. Great pics!!! Moved to CO this summer just an hour and a half south of the park! I plan to visit often!